Firm proposals announced for HS2 at Euston. Plans to bring high speed rail to Euston station and restore its place at the heart of the country’s transport network will be submitted to Parliament next week. 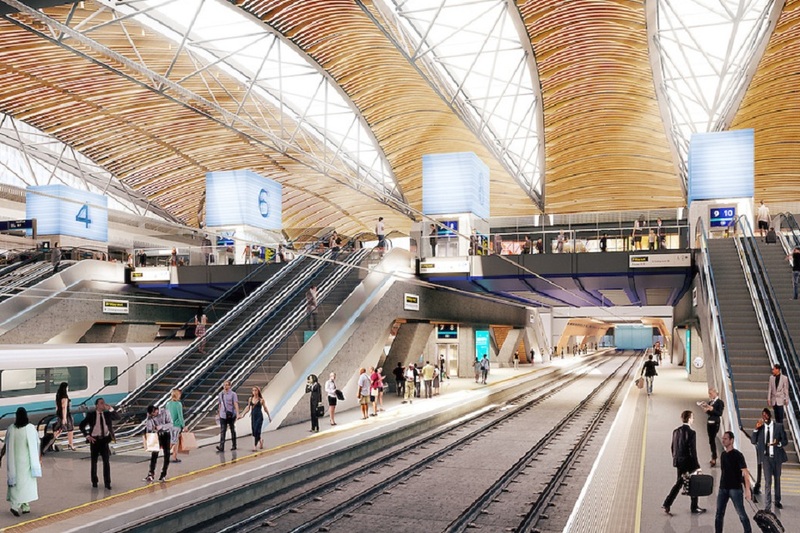 Eleven new platforms for HS2 will be built at the station in two stages as part of a phased approach that means less disruption for passengers. The plans, which will now be considered by Parliament, also offer the flexibility to transform the station into a thriving transport and community hub. 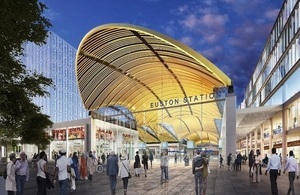 The new Euston station will provide high speed rail services from London to the Midlands, the North and Scotland. The latest plans, produced by HS2 Ltd following extensive work with rail industry partners and taking into account the aspiration for wider redevelopment, will unlock the potential at the site of the capital’s greatest regeneration opportunity. The provision of underpinning support structures as part of the plans will allow a range of uses above the station, delivering the flexibility for a future decision on the wider redevelopment and regeneration of the area. As well as the 11 high speed platforms provided by the new plan, at least 11 platforms will remain in the current station to serve the existing network. There will be new public spaces for shops, restaurants and cafes. The plans also enable potential redevelopment of the remaining existing station platforms and concourses, subject to future funding and approvals. The staged approach to building the high speed terminus means existing services can continue to operate, reducing both disruption for passengers and the effects on the community as a whole at any one time. London Underground facilities at Euston will also be significantly enhanced with passengers benefitting from greater space and connections to services including a new ticket hall and direct subway to Euston Square station. Access to taxis, buses and cycles will also be greatly improved. 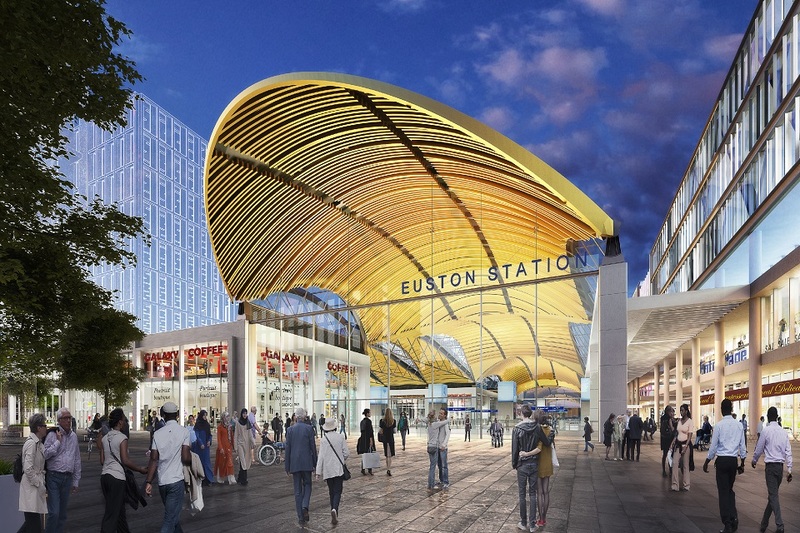 These firm proposals will allow Euston to fulfil its potential. It’s time for Euston to change. Not just if it is to fulfil its historic role as the gateway between London and much of the rest of the country, but also if it’s to become a much bigger and fully accessible part of its own community. London’s first inter-city train station, Euston opened in 1837. It now caters for around 42 million passengers a year – more than double the design capacity of the current station which was built in 1968. As passenger numbers continue to rise, its facilities and links with London Underground face an increasing and unsustainable challenge every day. Euston needs to become a station that both the nation and local community can be proud of – and share. It will be the best connected station in London; a crossroads between the north and the south, quickly and easily accessible from all parts of the capital and, with HS2, the country. “HS2 offers a once in a lifetime opportunity to revolutionise not just Euston station but a whole area at the heart of London. The new station will be the catalyst for wider redevelopment and so it is right that we are ambitious in our plans to dramatically improve the design, capacity and technology used. In addition, a leaflet was presented to the public in and around Euston station to provide information on HS2 Ltd’s vision for Euston station. you can view this leaflet here.